Vitamins – vital amines – are necessary for the body to function properly. Vitamin deficiencies can lead to a variety of ailments, increasing both morbidity and mortality, while getting enough of a vitamin can be good for many aspects of health. Vitamin K2 Benefits has been discovered relatively recently and the more we study it, the more we realise how beneficial it really is. One of the leading causes of heart disease is atherosclerosis, when the arteries of the cardiovascular system thicken with fatty plaque. Plaque formation begins when calcium from the bloodstream is deposited along the walls of the arteries instead of going into the bone matrix. There's a solution: vitamin K2-7. Recent studies indicate that both osteoporosis and cardiovascular disease may have a common factor: vitamin K2 deficiency. Vitamin K2 acts like a traffic policeman, directing calcium into the bone matrix, where it's needed, and keeping it from being deposited in the arteries, where it's not. It does this by activating certain proteins (such as matrix gla protein (MGP) and osteocalcin) through a process called carboxylation. These proteins inhibit tissue calcification and deposit calcium onto bone respectively, but can only work properly if they are carboxylated. Low levels of vitamin K2-7 mean less carboxylation, which means more calcium deposition in the arteries instead of the bones. With adequate levels of the vitamin, however, things tend to work as they should. By fighting plaque build-up, MenaquinGold® helps reduce the incidence of heart attacks, angina, and stroke. Reducing progression of insulin resistance. Carboxylating MGP, a known inhibitor of arterial calcification. MenaquinGold® also addresses a number of complications in patients with diabetes, including cardiovascular events, peripheral neuropathy, muscle cramps and low energy levels, as an effective biofactor. As we grow older, we need more calcium in our diets to keep our bones strong. But calcium can also be deposited in our arteries, leading to heart disease. 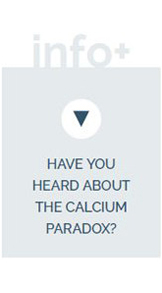 This is called the Calcium Paradox. Calcium supplements: good or bad? Calcium supplements and calcium rich foods are necessary to fight osteoporosis, a common disease in which bones become brittle and fracture easily. However calcium is not effectively deposited on the bones. Further calcium supplements also increase the risk of heart attacks by as much as 30%. Large populations consume the most calcium+D3 in the world, but still have worryingly high rates of heart attacks and osteoporosis. Obviously, something more is needed. Enter natto. Natto is a traditional Japanese breakfast food made from fermented soy beans . It’s eaten more frequently in Tokyo than in Hiroshima, and not eaten at all in Britain . A Japanese study  examined women in these three regions and found that the more natto they ate, the less likely they were to suffer hip fractures. There's a solution : Vitamin K2. The job of binding calcium from the bloodstream to the bone matrix and preventing its deposition in the cardiovascular system is done by proteins called osteocalcin and matrix gla protein (MGP), respectively. To do this, they first need to undergo a process called gamma-carboxylation, which is dependent on the presence of vitamin K2. A Japanese study found that levels of under-carboxylated osteocalcin decreased significantly in groups that received vitamin K2. No wonder astronauts who spend weeks in space take vitamin K2 – they need it to keep their bones strong in microgravity! MenaquinGold® keeps muscle cramps at bay A muscle cramp is a painful contraction and hardening of a muscle group, most commonly in the legs. Almost everyone (one estimate is about 95% of people) experiences a cramp at some time in their life, and they become increasingly frequent with aging. Remarkably, MenaquinGold® appears to be useful in preventing idiopathic cramps – that is, cramps with no determinable cause. A study by Mehta, et al. observed that a daily administration of vitamin K2-7 not only relieved existing muscle cramps but also helped prevent their recurrence. All the cells in your body depend on a chemical called Adenosine TriPhosphate (ATP) which helps to store and use energy. And your body’s ability to generate ATP depends primarily on the amount of oxygen in your system. Low oxygen levels are associated with lifestyle-related disorders like diabetes, hypertension, obesity and arteriosclerosis. High oxygen levels are associated with cardiorespiratory fitness and improved athletic performance. Studies show that vitamin K2-7 is associated with improved oxygen uptake and aerobic fitness. This can have a positive effect on athletic performance. It’s also good news for the rest of us, because it can help keep you safe from lifestyle-related diseases. The autonomous nervous system (ANS) plays an important role in the functioning of the heart. Disturbances in the ANS can lead to sympathovagal imbalance and could result in sudden cardiac death (SCD). Vitamin K2-7 shows promising results in the correction of the sympathovagal balance and helps to control peripheral neuropathy. Peripheral neuropathy (damage to the nerves of the peripheral nervous system) is a common problem faced by a large number of patients. It can be caused by multiple etiological factors. The most common are vitamin B12 deficiency, folate and diabetes mellitus with symptoms of sensory and motor defects. Even with good glycaemic control and vitamin B12 supplements, some residual neuropathy can remain. 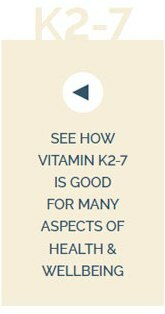 Studies show that the therapeutic impact of vitamin K2-7 is considerable in patients with peripheral neuropathy, being well tolerated and effective in relief of symptoms.. There are two natural kinds of vitamin K: vitamin K1 (phylloquinone or phytonadione) and vitamin K2 (menaquinone). In different ways, both are extremely important for health. Vitamin K1 is found in plants and algae, which use it to help transform sunlight into food. It enters animals who eat the plants, and then the vitamin finds a new function – it helps wounds heal through blood coagulation. That’s why it’s called K – from Koagulations-Vitamin, which is what it was called by the German scientists who discovered it. The amount of vitamin K1 in the typical human diet is 10 times that of vitamin K2. Vitamin K2 is made by bacteria in the human gut. It performs a range of functions that we are just beginning to understand. For instance, much of it is concentrated in the mammary glands – because babies need it to grow. Like K1, it is used by the liver to make coagulation proteins, but we now know that it also works in our bloodstreams to help place calcium where it belongs, in the bones rather than the arteries. Menaquinone includes a range of related forms, which differ mainly in the number of isoprenyl groups in the side chains of the molecule. If there are 4 such groups, it is called K2-4 (or MK-4, for menaquinone K-4). If there are 7, is called K2-7 (or MK-7). Vitamin K2-4 is a short-chain menaquinone that is found in meat and chicken, egg yolks, some cheeses and butter made from the milk of grass-fed cattle. You can also buy K2-4 in a synthetic form. Unfortunately, this has a short half-life and remains at therapeutic levels in the blood for only a few hours. To maintain useful levels of synthetic MK-4 in the blood, you need to dose yourself every few hours. Vitamin K2-7 is a long-chain menaquinone. The best dietary source is natto, a traditional Japanese dish. It can also be found in certain types of cheese and butter. Studies have shown that K2-7 has better bioavailability than other forms – that is, it is absorbed more easily by the body. It also has a longer half-life, which results in more stable serum concentrations. With prolonged intake, MK-7 accumulates to higher levels (7- to 8-fold) than other forms of vitamin K. It thus induces more complete carboxylation of osteocalcin – one of the essential processes for healthier bones and arteries. MenaquinGold® is vitamin K2-7. Vitamin K3 (menadione) is actually a synthetic analogue of the vitamin which can be toxic in large doses. It is not recommended for human use due to its toxicity. It is mainly used for animal feed.